Mapcraft WorldGen is a world creation tool designed with a production-line approach in mind. 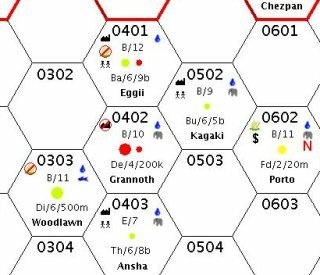 It was originally designed to generate worlds for a Traveller campaign, based on the original UWP data but expanding it to include multiple planets per star system. Though it has been designed to be compatible with Traveller, it does not adhere to the traditional Traveller conventions about how map information is displayed, and how world data is generated. As far as I'm concerned, these conventions were created in the 70s when everything had to be done by hand with pencil and paper. If you've played or read Traveller, then the map fragment on the left probably looks familiar, but different. 2D hex maps are still used for star charts, but the UWP hex codes are gone, with some data now displayed as text codes. The number and type of stars is shown (coloured according to the star's colour), as are trade icons and other symbols. For a full description of what the star maps say, see Map Legend. 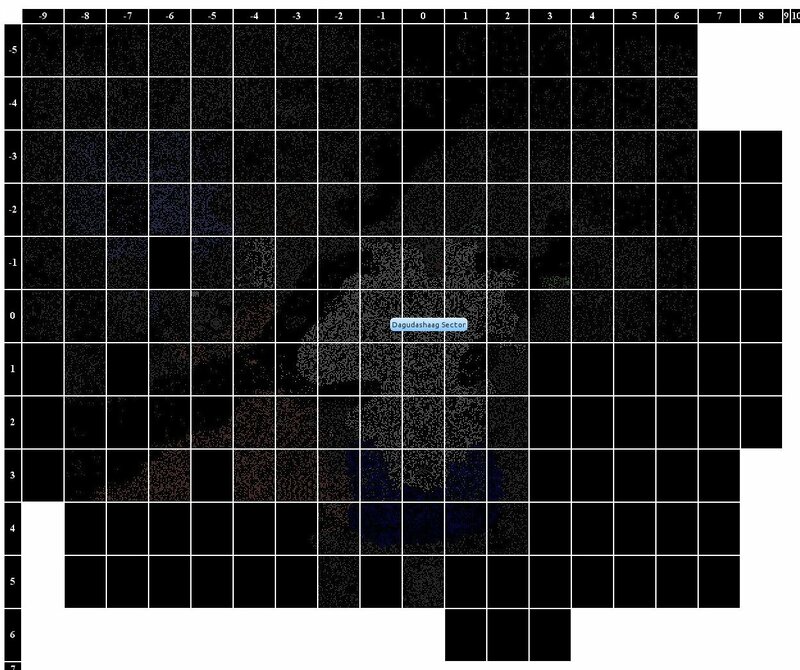 The generated star maps are just the first level of detail available. Each star system consist of many worlds, some with moons, all of which are detailed extensively. This is data for a small vacuum world orbiting close to its star in the Elphintrax system. The raw data, textual description and image are all randomly generated. The image generation is currently a work in progress, but the final plan is that every world and moon will have its own surface map. Populated worlds have a much longer textual description. Since the descriptions are random, they aren't guaranteed to make complete sense, but rules are in place to ensure they do as much as possible, and that they represent the raw data - e.g. high tech worlds have different description sets than low tech ones. The idea is to provide enough of a seed for GMs to be able to glance at a world and have a good starting point to present something to the players. 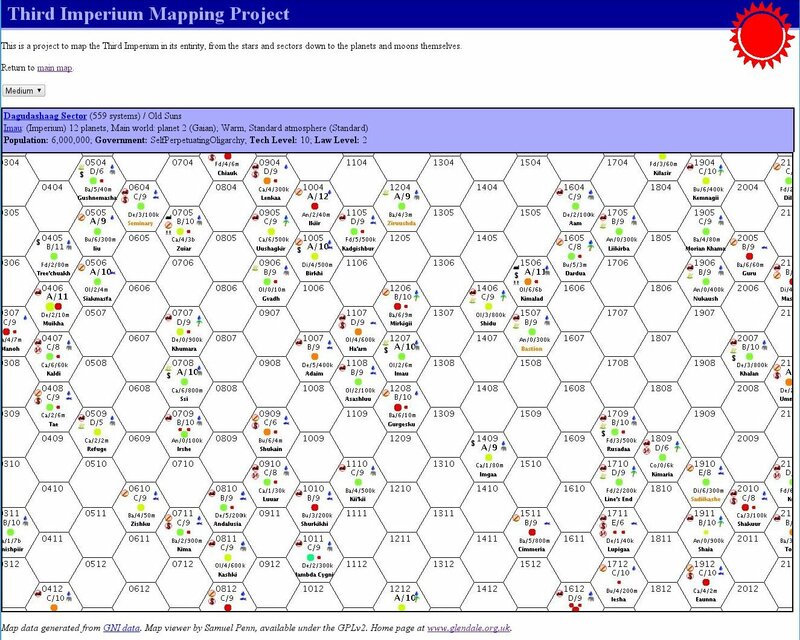 A large scale map of the entire Imperium is generated, which allows you to select which sector to initially view. A smaller scale map showing individual star systems can be scrolled by dragging it around (similar to Google Maps). Clicking on a star system shows extra information on that system, with a link to the full set of system data. The final part of the WorldGen system is a trade simulator for the universe. This keeps track of trade goods generated and consumed by worlds, as well as the ships which buy and sell them. This is truly alpha at the moment, whilst a basic trade system is put in place. An example of the latest output can usually be found at http://dev.glendale.org.uk/mortals. This is a view onto a development database, so may change without notice at any time. A more stable example is http://dev.glendale.org.uk/traveller. However, this is a live data set (it's being used for my current Traveller campaign), so the output is quite old and not up to the new standards.